In 1791, at the frontier headwaters of the Ohio River, gangs with blackened faces began to attack federal officials, beating and torturing the collectors who plagued them with the first federal tax ever laid on an American product - whiskey. In only a few years, those attacks snowballed into an organized regional movement dedicated to resisting the fledgling government's power and threatening secession, even civil war. With an unsparing look at both Hamilton and Washington - and at lesser-known, equally determined frontier leaders such as Herman Husband and Hugh Henry Brackenridge - journalist and popular historian William Hogeland offers an insightful, fast-paced account of the remarkable characters who perpetrated this forgotten revolution, and those who suppressed it. To Hamilton, the whiskey tax was key to industrial growth and could not be permitted to fail. To hard-bitten people in what was then the wild West, the tax paralyzed their economies while swelling the coffers of greedy creditors and industrialists. To President Washington, the settlers' resistance catalyzed the first-ever deployment of a huge federal army, led by the president himself, a military strike to suppress citizens who threatened American sovereignty. 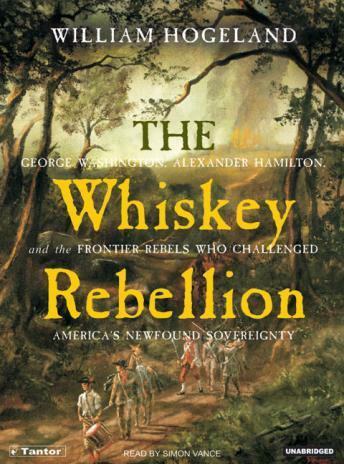 Daring, finely crafted, by turns funny and darkly poignant, The Whiskey Rebellion promises a surprising trip for readers unfamiliar with this primal national drama - whose climax is not the issue of mere taxation but the very meaning and purpose of the American Revolution. I enjoyed this book. Living in the notorious Washington county near so many of the sites of the cause, it gave me a sense of the people who came before me in this area. I always heard of the Whiskey Rebellion but never understood the actual struggle of the people living on the western edge of the then young country. I enjoyed the insight of the many patriots living at that time as the book revealed a very human quality to their cause. I enjoyed learning the details of these events, which have been only footnotes to history I've studied in the past. The author steps forward to describe the ordinary individuals and the famous individuals without pulling any punches. We learn about both their good qualities and their less savory qualities. Our nation emerged from rocky beginnings and was populated then, as now, by imperfect individuals. All around a pretty good book. It dragged on at points, but the detailed description of a largely foregotten topic made up for it. Provided many new details and insights. The farmers are always portrayed as villains in history books, but this book shows they had possible legitimate grievances. Also, gives glimpses of the influence of Hamilton.